Also by this author: Scaredy Squirrel series, Augustine, Leon the Chameleon, You’re Finally Here!, Have I Got a Book for You! The author is trying to tell a story about a mouse, but her cat Chester has got his paws on a red marker and is doing his best to take over the book. Chester is a selfish, egotistical, mischievous, bad, bad cat. Fortunately he is also pretty hilarious. 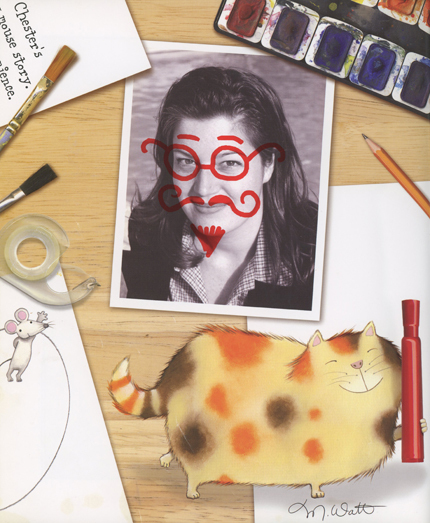 From the “Place award here” scrawled on the cover to the final endpapers, where he has added a beard and moustache to the author’s photo, Chester’s cheeky red marker can be seen on every page. The running dialogue between him and the author – about just who is in charge here – will fill young readers with delight. The narrative is actually pretty easy to follow, as the red marker is clearly the ‘voice’ of Chester and the regular text in the book is the author answering back. 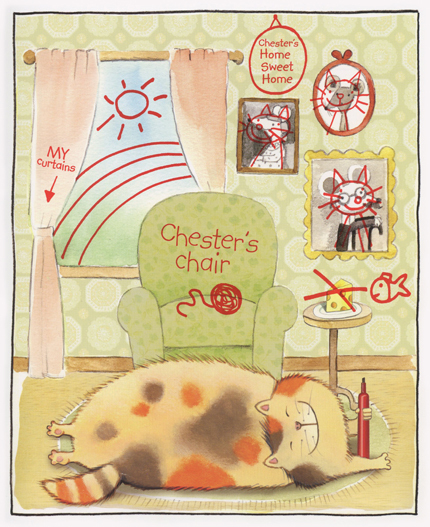 Preschoolers will enjoy this book, but 7 and even 8 year olds will still get a kick out of Chester’s antics. My 7-year-old isn’t interested in many picture books anymore (as being “too young”), but she still grabs Chester books whenever she spots them at the library, and giggles from start to finish. Melanie Watt is one of my all time faves. Have you read Augustine? Yes, what a beautiful book!